Trivia on the go to keep you on the go. If you are anything like me, when you run, you need something to keep you entertained. As you know, I canNOT run unless have something to entertain and distract me. The more you run, the more robust your entertainment selection needs to be to keep you entertained. For many Casual Runners this means music. A lot of music. In fact, early on in Casual Runner’s existence, a reader suggested that we share with our readers what we listen to while running. Because we pretty much give our readers whatever they want, our race reviews now include a “Playlist Peek” where we share some of the tunes that we add to our playlists for particular races. While music is great for racing, more often than not I need something different on my long half marathon and marathon training runs. 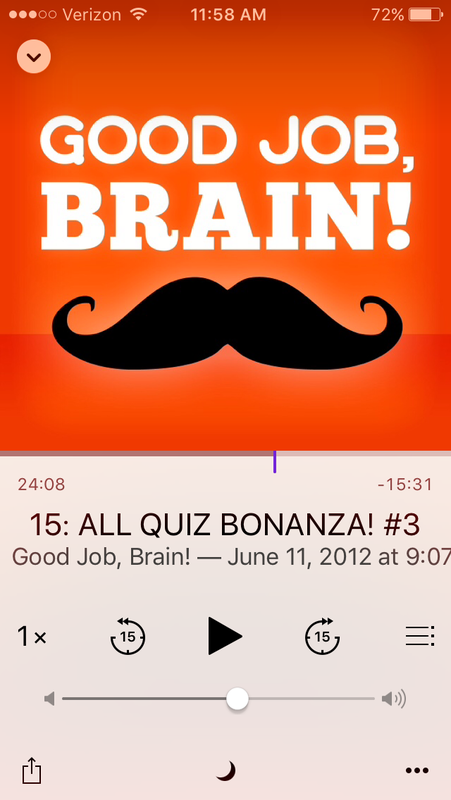 So, I turn to podcasts to entertain me while out for those solo training sessions. I want to share with you some of my favorites, including my newest obsession: The Good Job Brain Podcast. Tell Me A Little More? Every podcast has a focus, or a hook. This is pretty much a subject or genre on which the podcast team focuses. Good Job Brain is dedicated to what the team calls pub trivia. No, we are not talking academics sitting around in tweed jackets with suede elbow patches while smoking pipes. We are talking the kind of fun trivia you would get at a bar trivia night while you are hanging out with your friends. 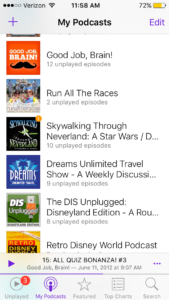 I learned about this podcast through Karen, a friend who I met through runDisney. As you can imagine, this means Karen brings a healthy amount of running and Disney knowledge to the show. Karen is joined weekly by a stellar podcast team of Chis, Dana, and Colin. Together they put on a fun show that is great to run to as their fun and fast paced banter help to pass the time during those long training miles. Look, running to podcasts is not for everyone. In fact, I know many runners who need their music to be a certain number of beats per minute or it does not work for them at all. But, if you are one of those Casual Runners who is looking for a fun and entertaining way to pass the time during your workouts, give Good Job Brain a shot. The podcast team’s conversation is light, fun, and at times, irreverent, which pretty much sums up my mental state during long runs. The show’s format lends itself perfectly to running as you can play along with the quiz portions and try and guess the answers. You may even learn something. Better yet, you may be so distracted by the trivia that you forget about the wall that you usually hit in mile 8 of your training runs. Speaking of distracted, I may have drawn a few sideways glances on the running trails when I shouted out an answer or two…yes, I may have looked a little odd. But enough about that. The Shows rotate among various topics and themes, with each podcaster contributing unique and entertaining insight and research to the discussion in furtherance of the theme. They also put together mini-quizzes and test each other’s skills. The shows are further broken up into smaller sections, so, if you happen to finish your run in the middle of a show, you can pause it and pick up later where you left off without skipping a beat. In the end, this is just a fun and entertaining podcast. The podcast team does an excellent job of making you feel as though, at the end of every show, you just spent some quality time hanging out with some good friends having a fun time. I cannot think of better praise to bestow. 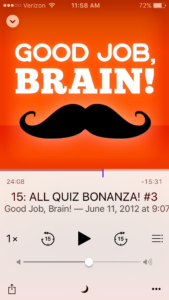 So, next time you are looking for something to entertain yourself before you head out for that long run, consider loading a few episodes of Good Job Brain onto your smartphone. You will be entertained, amused, and heck, you may even learn something. Just don’t answer too many of the questions out loud or the other runners on the trail might think you are a little weird.